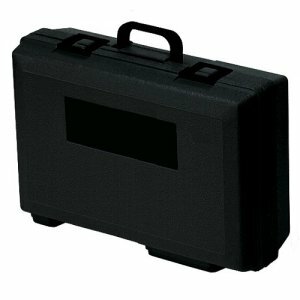 Description: Hard carrying case with custom-cut foam liner. Application: Cutouts to hold one documenting process calibrator, one Fluke Pressure Module, one BC7210 Battery Charger, one spare BP7217 Battery Pack, and test leads. Exterior: Blow-molded charcoal gray polyethylene with textured surface. Interior: Black, die-cut polyurethane foam.